Just like in 2016, this new ballot measure is clearly nothing more than anti-fracking activists seeking to exploit voters in an relinquishing quest to fulfill their “keep it in the ground” agenda and ban all oil and gas development in Colorado. Through a Facebook live announcement in conjunction with a press release distributed by the newly formed group, Colorado Rising, the anti-fracking coalition cites several health studies that have been thoroughly debunked by Energy in Depth as the reason for putting forth yet again, another ballot measure. The study referred to here is the McKenzie’s study has been disavowed and discredited by state health officials stating“[T]his study’s conclusions are misleading in that the study questions a possible association between oil and gas operations and childhood leukemia; it does not prove or establish such a connection,” Dr. Larry Wolk, Chief Medical Officer and Executive Director of the Colorado Department of Public Health and Environment (CDPHE) wrote in a statement. 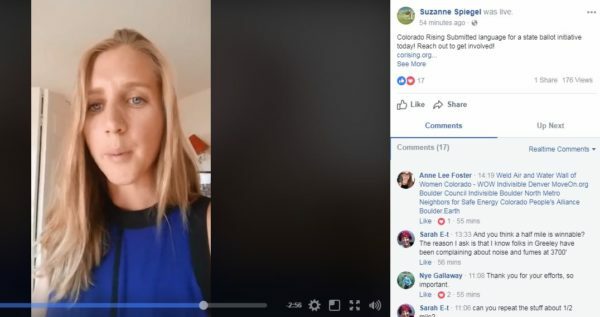 In Spiegel’s Facebook Live Video, she says that “this [oil and gas] industry can create a lot of fear,” and as you go on listening, she then gives a laundry list of fear mongering claims including a misleading new study claiming to link infant health problems with oil and natural gas development. The study cited by Colorado Rising raises questions about whether the author of this study oversold its findings to the press when it came out last week. But either way, and not surprising, anti-fracking activists surely bought a bill of goods with this one. The very similar setback initiative from 2016 has taught us a few things, and made us do our homework too. According to an economic assessment from the Business Research Division at University of Colorado Leeds School of Business, a measure like what we will see in 2018 is projected to cost Colorado’s economy billions in lost GDP. Economists have found that a 2,000 foot setback distance could cost the state up to $11 billion in lost GDP a year and 62,000 jobs. Keep in mind the 2,000 foot setback examined in this study is modest compared to the 2,500 foot distance that activists are attempting to put before state voters, yet again, next year. “Colorado Rising was started by Coloradans who live in or near impacted communities and are committed to the health and safety of people in our state, because if we don’t protect Colorado, no one else will,” said Tricia Olson, with Colorado Rising. That name rings a bell… Tricia Olson, who headed the now-defunct “Coloradans Resisting Extreme Energy Development” and Micah Parkin, executive director of 350 Colorado, who in the past has compared oil and natural gas regulations to “many other oppressive policies, such as slavery, and women and people of color not having the right to vote.” And that’s just to name a few of the usual suspects taking the lead of this brain child. With that in mind, we have an idea of what to expect from this group as we head into 2018. Spiegel claimed in her Facebook live announcement that this is “winnable.” However, if history proves itself correct, this type of ballot measure has been and will continue to be rejected and sharply criticized by elected officials on both sides of the aisle, business leaders, and editorial boards across the state.